Read to learn..a perfect place for book lovers!! 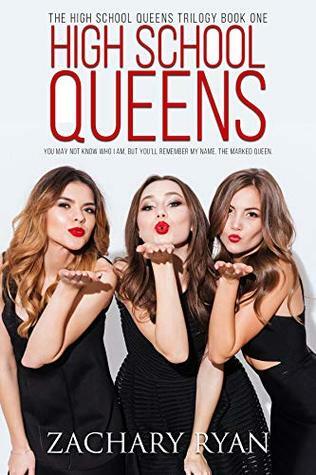 High School Queens by Zachary Ryan is the first book in the trilogy. The plot based on American high school drama and a life full of secrets. I am in love with the cover page. It's striking. This is my first read of this author, and I must say I am impressed. The main characters are a bunch of high school students. Aman, Calvin, Danielle, Andrew, Delilah, and, Jasmine. They all come from a different section of society. They all have different dreams, but one thing is common which connects them all. They all try to hide their secrets. Living double lives. In order to keep their persona intact, they can cross any line. Aman comes from an Indian Muslim family where he is not allowed to live a life of his choice. Calvin is a star baseball player, but he is struggling to come out and accept his real self. Danielle loves her social standing, but her dreams and life shattered when her parents got divorced. Andrew is an alcoholic trying to live a sober life. Delilah has no self-esteem. She just wants to hurt herself. Jasmine in a desperate need of love and approval from others. Their lives turn upside down when someone named The Marked Queen claims to know all their dirty secrets. She warned them that she will destroy all of them at prom night. Everyone is frightened, and the backstabbing begins. Zachary Ryan narrates the story smoothly involving every necessary aspect. All the characters get their space to grow and establish their connection with the readers. The story is full of twist and turns. It hooked me from start to an end. It leaves me with the thoughts that why the needs for love, attention, and affection turns a human into a whole different person. We all hide our tears because we don't want to see how messed up we all are or we can't afford to see our scars to others. The whole story is based on this. All the characters are fighting with their inner demons to find their right place in school or in society. This book proves to be a refreshing read. It is fast-paced. The author did an incredible job. At some places, there are spelling mistakes, but they are avoidable. Zachary Ryan describes body shaming, gay's perspective, low self-confidence, suicide attempts, social standings, abusive parents, catfights, sexual need, lies, and the importance of accepting the truth. This book covers almost every topic which a teenager goes through in their life. I really like how the characters make peace with themselves. I can't wait to read the next book in the series. The Marked Queen agenda is quite clear from the starting, but I am looking forward to reading her dirty secrets now. I recommend this book to young adult lovers, newbies, and those who enjoy reading high school drama. Amazing review. It reminded me of a series named Pretty Little Liars. Good work 👍 keep going. When they go low, we go high. Aakanksha has read 1 book toward her goal of 50 books.